Work to improve journeys by carrying out vegetation management at the junction takes place this week. Lane closures will be in place on the M3 southbound overnight, between 9pm and 6am, from Monday 3 December for two nights. In addition, lane closures will be in place on the M3 northbound overnight, between 9pm and 6am, from Wednesday 5 December for three nights. Work to improve journeys by maintaining the electronic signage at the junction takes place this week. The northbound entry slip road will be closed overnight, between 9pm and 6am, on Wednesday 5 December. A clearly signed diversion will be in place via junction 11 and return. Work to improve journeys by maintaining the traffic signals at the junction takes place this week. The northbound exit and entry slip roads will be closed overnight, between 9pm and 6am, on Tuesday 4 December. Clearly signed diversions will be in place via the adjacent junctions. Work to keep road users informed by maintaining the signage at junction 6 and the overhead messaging signs along the M4 takes place this week. The M4 will be closed in both directions between junctions 6 and 7 overnight, between 9pm and 6am, from Monday 3 December for three nights. A clearly signed diversion will be in place via the A4. In addition, the westbound entry slip road at junction 6 will be closed overnight, between 9pm and 6am, on Thursday 6 December. A clearly signed diversion will be in place via junction 5 and return. Work to improve journeys by converting the M4 into a smart motorway continues this week. 24 hour narrow lanes and a 50mph speed restriction will be in place until next spring. Work to ensure road user safety by maintaining the drainage system along the M4 continues this week. Lane closures will be in place on the east and westbound carriageways overnight, between 9pm and 6am, until Tuesday 4 December. In addition, the westbound exit slip road at junction 14 will be closed overnight, between 9pm and 6am, from Wednesday 5 December for three nights. A clearly signed diversion will be in place via junction 15 and return. Works to ensure road user safety by replacing sections of the safety barrier continues this week. The eastbound entry slip road at junction 15 will be closed overnight, between 9pm and 6am, from Monday 3 December for three weeks (Monday to Friday only). A clearly signed diversion will be in place via junction 16 and return. Work to maintain journeys and ensure road user safety by replacing the Romsey Road bridge near junction 3 continues this week. A 50mph speed restriction is in place on the M27 east and westbound carriageways beneath the bridge until next summer. Work to monitor the network by undertaking detailed surveys of the A3 northbound takes place this week. The A3 northbound will be closed from junction 2 of the A3(M) at Horndean to Weston (just south of Petersfield) overnight, between 9pm and 6am, on Thursday 6 December. A clearly signed diversion will be in place via the A3(M) southbound, M27 to junction 10, north on the A32 then east along the A272 to re-join the A3 at Petersfield. For drivers not permitted to travel on a motorway, a diversion will be in place south on the A3 London Road to Cosham, west along the A27 to Fareham, north on the A32 then east along the A272 to re-join the A3 at Petersfield. Work to undertake surveys on the A3 northbound takes place this week. The A3 northbound will be closed from Longmoor to Hazel Grove Lodge (just south of the Hindhead Tunnel) overnight, between 9pm and 6am, on Wednesday 5 December. A clearly signed diversion will be in place via the A325 and A31. Work to ensure road user safety by maintaining the street lighting at the Milford junction finishes this week. The northbound exit slip road will be closed overnight, between 9pm and 6am, until Thursday 6 December. A clearly signed diversion will be in place via the Shackleford junction. Work to keep road users informed by maintaining the signage and the A3 northbound between the Stoke Interchange and Burpham continues this week. The A3 northbound will be closed overnight, between 9pm and 6am, from Saturday 8 December for two nights. In addition, the southbound exit slip road at the University Interchange will be closed overnight, between 9pm and 6am, on Monday 3 December. A clearly signed diversion will be in place via Compton and return. Work to improve wildlife habitats by carrying out vegetation management along the A31 takes place this week. A lane closure will be in place on the A31 westbound overnight, between 9pm and 6am, from Wednesday 5 December for two weeks (Monday to Friday only). Work to ensure road user safety by maintaining the drainage takes place this week. The eastbound entry slip road will be closed overnight, between 9pm and 6am, from Monday 3 December for two nights. A clearly signed diversion will be in place via the Ashley Heath roundabout and return. 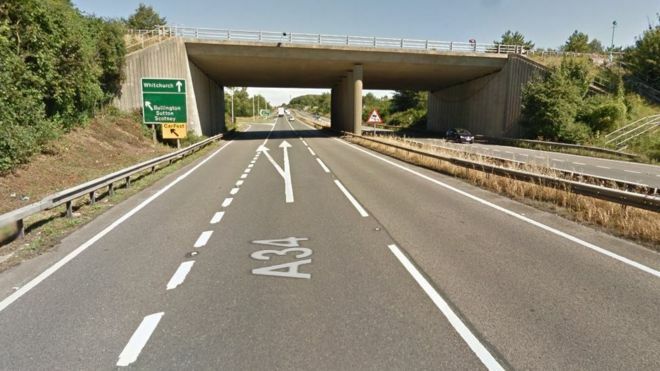 Work to undertake surveys of structures along the A34 in Hampshire takes place this week. The A34 northbound from junction 9 of the M3 to the A303 at Bullington Cross will be closed overnight, between 9pm and 6am, on Wednesday 5 December. In addition, the A34 southbound from the A303 (Bullington Cross) to junction 9 of the M3 will be closed overnight, between 9pm and 6am, on Thursday 6 December. A clearly signed diversion will be in place using the A33 and A303. Work to undertake surveys of structures along the A34 in Hampshire takes place this week. The A34 northbound from the A303 (Bullington Cross) to Tot Hill will be closed overnight, between 9pm and 6am, on Monday 3 December. In addition, the A34 southbound will be closed from Tot Hill to the A303 (Bullington Cross) overnight, between 9pm and 6am, on Tuesday 4 December. A clearly signed diversion will be in place using the A303, Basingstoke and A339.